Here's a picture I find rather atmospheric, in a Halloween sort of way, thanks to the uneven ground and amazing trees. 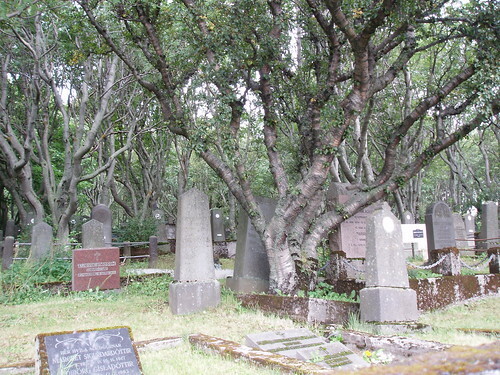 I took this photo in a cemetery in "Old Town" Reykjavik, Iceland in 2005. Literature of the Day: Here's a short and haunting poem for your Monday. How did you like Iceland? I loved it! It was amazing. My favorite day was spent at Thingvellir, the site of the Althing, right out of the sagas. It was breathtaking. Oh, yes! It's marvellous, isn't it. Beautiful picture. It reminds me of the cemetary at Sewanee. I used to take frequent walks there in the autumn. Thanks! That cemetery sounds amazing - like the perfect place for autumn walks. I love the trees in the picture! They were SO amazing. The picture doesn't nearly do them justice. Thank you so much! I was fascinated by the scene. Excellent picture. I love visiting cemeteries. I'd love to visit Iceland eventually as some of my Dwarves (and perhaps a few Elves) in the book I'm writing dwell there. Iceland and Ireland, two places I'd love to visit. I've been enjoying these halloween post every day. Thanks so much! There are more pictures from Iceland, including more pictures of the cemetery, here. Iceland is the perfect place for Dwarves! I'd love to visit Ireland one of these days. Thank you so much for visiting my blog. I'm so glad you're enjoying my posts!